One of our Thanksgiving family traditions is to see a movie together. This year the pick of the day was COCO. And I loved it! By the way, is it just me or was THE INCREDIBLES a long, long time ago? (2004!!!) Well, this trailer filled me with so much joy that I have to embed it here for all of you to enjoy as well. I think the sound featured in this trailer may be the best one ever. It may me weep with laughter and joy! Watch it. You'll see (hear). And now back to COCO. 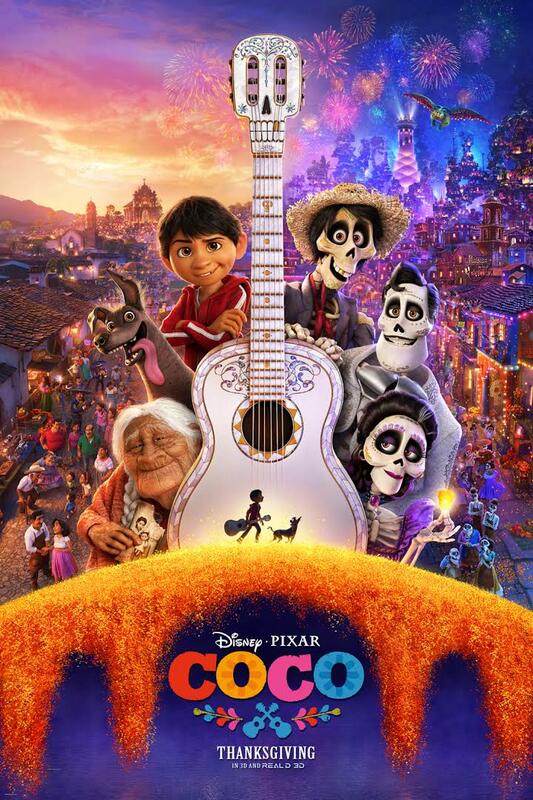 Take a little boy who loves music and throw in a family ban on music and dia de Muertos, and you've got a rich and visually stunning movie. 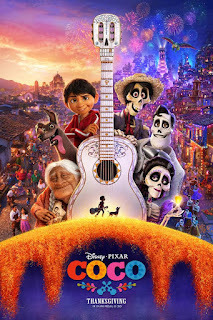 I loved our young hero and felt invested in his adventure across the bridge... and most of all I was touched by how this movie showed so much of the magic and warmth of the Mexican culture -- especially in its appreciation for the elderly. Here is a picture we don't see often in American movies: great-grandmother Coco beloved and valued, a vital part of this multi-generational family. No putting Grandma in a corner here! No stashing her in a nursing home! Her life is important, and all the younger members love and include her, even as she nods off and forgets things. Grandma Dykes - cooking, of course! It made me wish for one more kiss on my Grandma Dykes' papery cheek.... I could have done more. I wish I'd done more. And the movie also filled me with the spirit of all my loved ones who have already crossed that bridge. I miss them, yet they are here with me. Beautiful, meaningful movie. Hats off to Disney for bringing a quality multicultural film into the mainstream. Go see! It's on my list, highly recommended by Imi's family before I had even heard about it. And the pic of your grandma in her kitchen is priceless!